There’s another new addition creating buzz at the National Championship this year and not one person is competing for a prize. It’s called Regalia and it’s a Saturday night party to celebrate purebred dogs. The best part is it is held right outside the group ring at the show (so you don’t have to walk a mile) and it doesn’t go on all night (so you can get some much-needed rest). Read on for more information. New and different has become a defining feature of the AKC National Championship as much as the glitz and glamour of the show itself. This blend of official/non-official events might not jive with conventional perceptions, but, nonetheless, it has become a gateway for countless breeds and exhibitors that customarily opt out of high profile AKC competition. Obviously, weird and complicated never figured into the original concept. And honestly, every time a new element is added to the show it’s seems, on the surface, like a new frontier of insanely bad planning. Nothing could be farther from the truth. Hosting conformation and performance events under one roof, impossible, right? Check again. In terms of both participation and spectator support, the numbers just keep climbing. An AKC show having multiple competitive events open to unrecognized breeds? That ranks among the biggest success stories with no sign of slowing down. Non-regular competition? They said nobody’s going to bother entering something like that, let alone travel across the country to compete. From the start, BBE has been a hit. It drew over 1000 entries this year. And now the latest addition to that non-regular roster, the Puppy Sweepstakes, pulled over 1200 entries. Case closed. Juniors? They won’t come to something like this ever. Agility, Rally, Obedience, and the regular all breed shows are all going strong. At this point, this illogical mish-mash is a National Championship hallmark. It’s also an overambitious, unprecedented, logistical nightmare that should inevitably descend into chaos but somehow never does. That’s no accident and it’s not the Wizard of Oz behind the curtain seemingly making it all run smoothly. However, Jason Taylor will be the first to admit it ain’t easy. “We do a lot between the diving dogs, the agility and obedience invitationals, along with the vendors.” (That long list will kill my word count.) “It can get really crazy but it makes it for a rich, fun event,” he says. Officially, he is the Assistant Show Chairman and he’s been part of that strategic planning team for ten years, first with Eukanuba and now with Royal Canin. More importantly, he’s been in dogs way longer than that, having had Airedales, Wires, Lakelands and Afghans. Obviously, he knows the drill. Taylor says, “A lot of the new events seem surprising when they’re first announced but so far it’s working.” That’s true but still doesn’t explain the success. He says, “In many cases, the big successes have also been the biggest logistical nightmares. When we created the Friday specialty day about four years ago, we thought that incorporating specialties into the National Championship would increase the overall prestige of the event. The top dogs are already there and this would encourage more breeder participation.” More crucially, “the breeder, judge, and local club involvement would really celebrate the purest form of dog shows.” Sound reasoning, idealist aspirations, hmmmm…usually not a formula for success. He admits hosting this event is no luxury cruise. “It gets busy and can be really difficult. But we have the right people in place. The superintendents and show committees are great about cooperating with each other. A number of us have been together for several years and we all have the same mindset. We stay focused on what we are trying to accomplish and protect the things that are important,” Taylor says. Forget about logistics; that seems like a philosophical impossibility. The Canine Chronicle is proud to be a supporter of Regalia. With signature cocktails, beverages, desserts and live music, this is great way to cap off an outstanding week at the show. 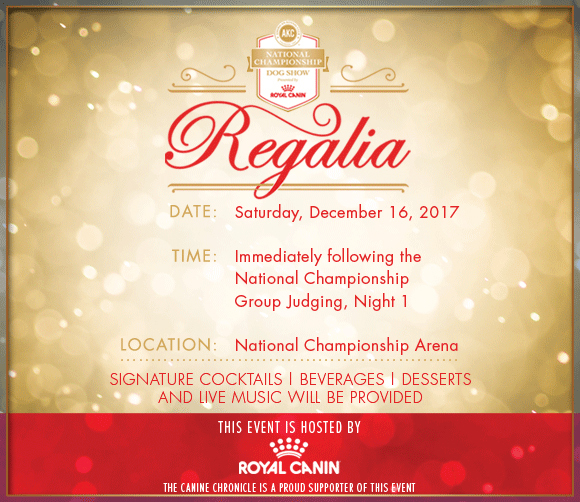 This celebration is open to everyone attending the National Championship and is a wonderful way for everyone to celebrate purebred dogs at what has become one of the most important shows in dogdom. Posted by admin on Dec 15 2017. Filed under Editorial, Featured. You can follow any responses to this entry through the RSS 2.0. Both comments and pings are currently closed.